This page currently reflects the 2018 - 2019 Tree Recycling information. New information will provided as soon as possible. If you know of any other recycling options, please send us an email. Christmas trees must be prepared according to the yardwaste collection regulations to be collected as a part of your Omaha solid waste collection service. Please remove bags, ornaments, and lights, nails, wires, tree stand, plastic bags (please take bags home and dispose with garbage). Wreathes and evergreen roping will not be accepted but flocked trees are ok.
Share the Christmas spirit and ask a neighbor if you can help them get their tree to a recycling site. All sites close on Monday, January 7, 2019. Do not deliver trees after this date. Doing so is illegal dumping and punishable by a fine of up to $500, loss of drivers license for 6 months and all clean up costs. Omaha Municipal Code, Chapter 34, ARTICLE I, Section 4. Please throw your tree up on the pile. This will leave room for others to access the site. The sites are open daily during daylight hours starting December 24. Volunteers from the Rotary Clubs of Omaha, and the Douglas-Sarpy Master Gardeners will staff the busy sites (A - Tranquility Park and D - the F Street Football Field) and help you unload your tree on both December 29 - 30 and again January 5 - 6, 2019 from 10AM until 4PM each day. Sites will close on Monday, January 7, 2019. 120th Street & West Maple Road. North lot of soccer complex. F Street East of 156th Street. Parking log east of field. View the 2018 - 2019 City of Omaha Christmas Tree Recycling Web Page. 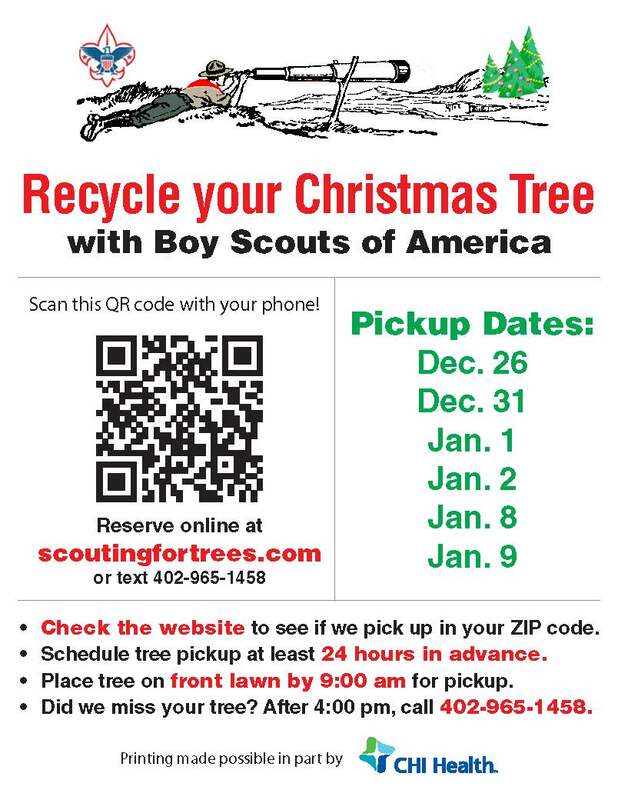 Scouting 4 Trees is offering to pickup trees and transport them to a City recycling site if you are in a listed ZIP Code. Christmas tree collection sites will be opened during daylight hours starting on December 27th through January 9th, 2017. Curbside collection for real Christmas trees will occur the first full week of January, 2019 for residents on City waste collection services. Trees will be picked up the same day as regular garbage and recycling collection and need to be on the curb by 7 a.m.
at no charge through the month of January. The Recycling Center is at 4441 Gifford Rd, Council Bluffs, IA 51501. Non-residents and commercial haulers will be charged a $5 minimum fee or $20 per ton at the Recycling Center. Please note: Remove all lights, nails, ornaments, tinsel, wire, steel or wooden stands and all plastic tree bags. Click here for the City of Council Bluffs official website. Fremont Parks and Recreation Department, along with Keep Fremont Beautiful (KFB), is offering a FREE Christmas Tree Recycling Collection Site where collected trees will be used as mulch in the Fremont Park System. The drop-off location is the Lenihan Building Parking Lot between 9th and 10th streets on the east side of Broad Street. This recycling site will be open from December 26, 2018 through January 7, 2019. Please note: this is a collection for Christmas trees only – no garlands or wreaths. All wire, stands, ornaments and plastic bags should be removed from the trees before recycling. Click here for the Fremont Tribune post. Take your tree to one of sixChristmas tree recycling sites in Lincoln by January 21, 2019. Recycling your Christmas tree will save space in Lincoln's landfill. View the 2018 - 2019 City of Lincoln Christmas Tree Recyling Program Information. can help recycle your tree. Your free will donation support is always appreciated. Dates available for scheduled pickups are December 29, 30 and January 1, 5, 6 and 12, 2019. Omaha: 68104, 68106, 68114, 68116 - 68118, 68122, 68124, 68127, 68130, 68132, 68134 - 68138, 68142, 68144, 68152, 68154, 68157 and 68164. Lincoln: 68502 - 68508, 68510, 68512, 68516, 68521, 68522 and 68526. Click here to go to the Scouting 4 Trees site so that you can sign up. This is a free service but donations are gratefully appreciated!